Since Gwynne Mhuireach, a doctoral student in landscape architecture, left the farm where she grew up near Klamath Falls she became curious about health differences between people who grew up in rural and urban areas. With a bachelor's degree in biology from the University of Washington and a master's degree from the UO in architecture, Mhuireach initially got involved in the Biology of the Built Environment Center's pioneering exploration of microbial communities inside buildings. Now, she's back outdoors looking at greenery — particularly the microbes in the air above and around the vegetation — in urban areas. She's just completed a pilot study in which she explored Eugene's parks and parking lots. Her findings are in the journal Science of the Total Environment. "We're starting to build larger and more complex cities," Mhuireach said. "I am interested in ways to help maintain people's health and happiness as we do so. Some studies say that as we are building these denser cities we are losing green space. I am looking for mechanisms that explain why vegetation helps people and how we can design for it." At a glance, her findings are intuitive: Airborne bacterial communities differ from one park to the next, but those of parking lots are alike and also differ from those of parks in subtle but potentially important ways. After all, parks often have different vegetation in them, and parking lots are much the same — asphalt bombarded by solar radiation as well as exposed to heavy metals and fuel from vehicles. The importance is that the study gets at not only the differences in microbial communities but also how far from a park the influence may extend, says co-author Bart Johnson, a professor of landscape architecture. It sets a baseline for future studies. It also proves that their inexpensive data-collection approach — putting out sterilized petri dishes to collect air samples — works just fine. The research team collected six air samples over an eight-hour period at five parks and five parking lots. All locations were free of tall trees that block air movement to limit the effect of microbial differences due to air circulation. The idea, Mhuireach said, was to first discover whether vegetation was a significant source of microbes for nearby areas. The samples were gathered using three petri dishes and three vacuum-pump-driven units — all placed 6 feet above the ground at each site. Researchers collected 5.8 million DNA sequences representing 16,633 genetically distinct microorganisms from 40 unique bacterial groups. DNA analyses found that the bacteria Sphingomonas, commonly found in soil and on plant surfaces, accounted for one fourth of all bacteria collected. Another four soil-associated species also were abundant. 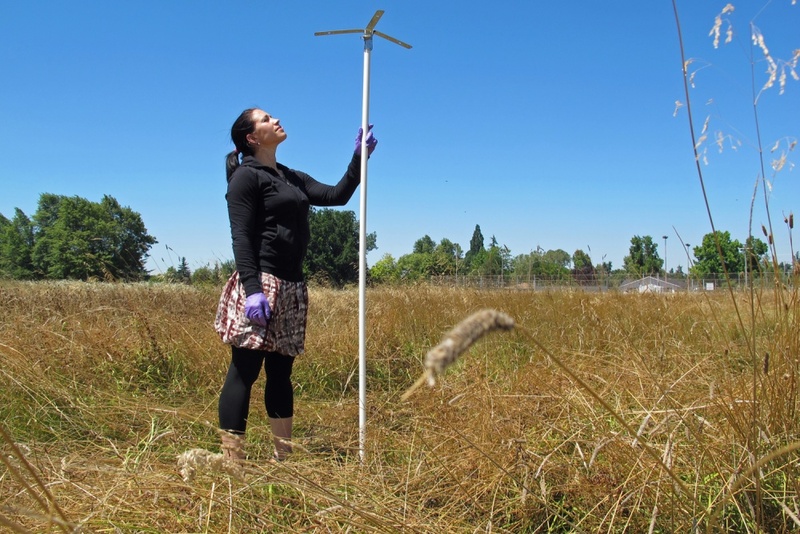 Samples were gathered during the harvesting season of the grass-seed industry north of Eugene, when prevailing winds likely blew associated microbes into the sites, researchers noted. Parking lots were similar to each other, with a prevalence of Acetobacteraceae, another family of plant- and soil-associated bacteria, while parks had unique bacterial fingerprints likely reflecting vegetation types in and near each park. "There have been studies that compared the health of children who grow up on farms versus cities," Johnson said. "They've concluded that the lower incidence of allergies in children from farms was related to different microbial exposures, but there has been little work to examine whether there is enough microbial variation at the fine spatial scales of a park, a street or a block to potentially influence the health of children in cities." It may be, Mhuireach said, that healthy air depends not just on the absence of bad things like pollutants, but the presence of good things such as bacteria with which humans have co-evolved.